Wienerschnitzel, the world’s largest hot dog chain, is excited to announce its newest Monster Energy Supercross partnership with Feld Motor Sports, the world leader in specialized arena and stadium-based motor sports entertainment, for select 2016 West Coast Supercross races. Upping its sponsorship level at the west coast events, Wienerschnitzel will have the opportunity to engage with over 45,000 fans at every race. 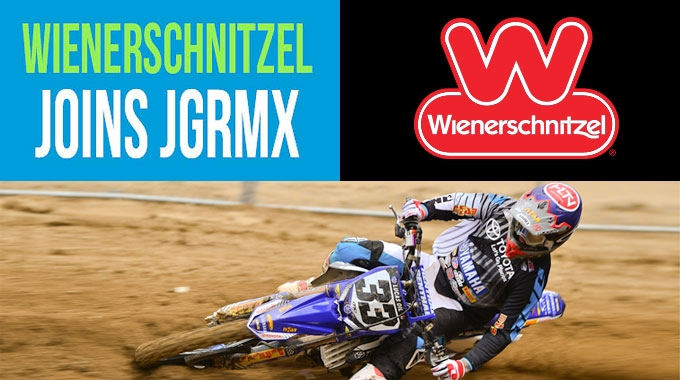 With this new level of partnership, Wienerschnitzel will have a large pit presence at the races as well as promotional mentions via a variety of media vehicles including television and radio broadcast. Attendees at select West Coast Supercross events will have the opportunity to cheer on local dachshunds competing on the track for the title of “Fastest Wiener in the West” during the Wienerschnitzel Wiener National race! Wienerschnitzel fans are encouraged to enter the #Wienercross online sweepstakes for weekly chances to win tickets to select races, along with other sweet prizes. One lucky fan will win the grand prize of a Supercross Finals VIP trip for four in Las Vegas!